Like MegaSpin pokies, multi-hand video poker allows us to play several turns simultaneously and cash in on multiple winning combinations at once. Let’s take a look at how these exciting electronic poker games work, as well as where Australians can play the best virtual multi-hand poker titles over the Internet. All of our trusted online casinos offer real money video poker, including a super selection of multi-hand games. They also carry hundreds of Web pokies, progressive jackpot pokies, online blackjack, roulette, baccarat and much more, as well as a stack of great interactive titles for iPhone, iPad, Android, Windows Phone and other mobile devices. Full international accreditation and 128-bit SSL (Secure Socket Layer) digital encryption make banking with these top-ranked gambling sites as safe and secure as dealing with the cashier at any land-based casino in Australia. 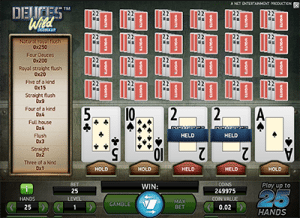 There are several variations on the multi-hand poker platform online. While the run of play can differ subtly from game to game, and some titles have greater scope than others, the overall premise is the same: we can play numerous hands simultaneously, with the chance to collect multiple payouts at once. Multi-hand games start out like any other form of electronic poker; we get five cards, decide which ones to hold, and throw the rest away for new cards (see our video poker page for more on rules and how to play). What happens next is where it gets interesting. In most multi games, the cards that we held in our initial hand are then held in all of our multiple hands – whether we are playing five hands or a hundred. For example: if we are playing 10 hands and decide to hold a pair of Kings, those Kings are locked in every one of those 10 hands. Each individual hand is played with a standard French deck of 52 cards (with the exception of Joker Poker varieties, which include one or more Jokers as wild cards). Betting options can vary slightly from standard video poker (e.g. Power Poker games only allow us to play five coins per turn). The important thing to remember is that whatever wager size you choose, that amount applies to each individual hand. So, for example: if we opt for five coins at 0.25 per coin, we are betting 1.25 credits per hand; and if we play four hands at once, we are in fact wagering 5.00 (4 x 1.25) per turn. Our top Aussie-dollar Web casinos stock dozens of entertaining and rewarding video poker titles, including several real cash multi-hand games. Below are a couple of the best known collections, from two industry-leading developers of Internet video poker software. 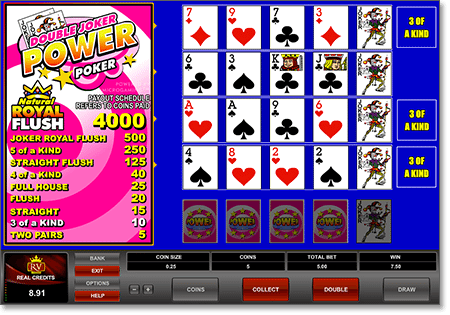 The Power Poker range by Microgaming – the global trend-setter in online casino development – is the most widely available multi-hand video poker format for Australians. These games are supercharged versions of the classic Microgaming titles, giving us four hands at once while keeping the same great payouts and features as the original versions. Popular variations include Jacks or Better, Deuces Wild, Aces and Faces, and various styles of Joker Poker. Our favourite is Double Joker Power Poker, which is as fun to play as it is to say. With the Net Entertainment VP titles available at Slots Million, we can choose to play one, five, 10, 25, 50, or 100 hands per turn with standard video poker rules. These are all available for instant play via Web browser, so all Aussie gamblers – whether on PC, Mac, or mobile – can enjoy classic real money multi-hand games such as All American and Joker Wild without having to download a single thing. In single-hand video poker, a dud deal means you’re already thinking about the next hand. When there are several hands in play, however, there is no telling what we might pick up on the draw. And even if we don’t come away with anything special, it is very rare indeed to wind up empty handed when we have upwards of five hands on the go. Thus, at the very least, multi-hand poker allows us to mitigate our losses when the cards aren’t falling our way. Let’s say we are playing Jacks or Better poker. In a standard game, a pair of Queens isn’t heaps to crow about; you know you will do well to get two pair or three of a kind on the draw. When there are heaps of hands in play, however, that brace of matriarchs becomes something to get excited about. With up to 100 hands in action, we are guaranteed to at least get our bet back while holding the potential to draw some three of a kinds, full houses, and four of a kinds as well. Are there any drawbacks to multi-hand poker? It depends on your point of view, and perhaps your gambling style; traditional card players and old-school punters often prefer to play one hand at a time. The main thing to note is that playing 100 hands can cost a pretty penny (the minimum bet in most Power Poker games is $5.00 per turn), so make sure you have the bankroll for it and know exactly how much you want to wager on each set of hands. Royal Vegas Casino is our number one website for multi-hand video poker in Australia. Along with hundreds of other Microgaming digital casino titles, this eCOGRA-approved site offers an extensive selection of interactive multi-hand poker titles – including a slew of Power Poker variants and some exciting Level-Up Poker progressive games. Australians can also enjoy the RV mobile casino for real cash gambling via smartphones and tablets, while the AUD bonuses and promotions on offer are among the most generous on the Web. Play multi-hand video poker variants at Royal Vegas Casino and get up to AUD $1,200 in bonus credits when depositing real money.